It is easy to love the mango tree for its sweet, juicy fruit or the flamboyant for its showy crown of flowers. Both come from far away, yet have become a part of Caribbean landscapes and cultures. 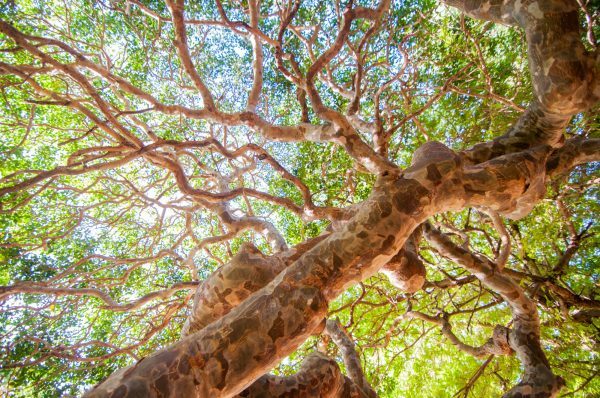 The true native jewel of the Caribbean is a tree that is unfamiliar to many, but without equal in many ways. 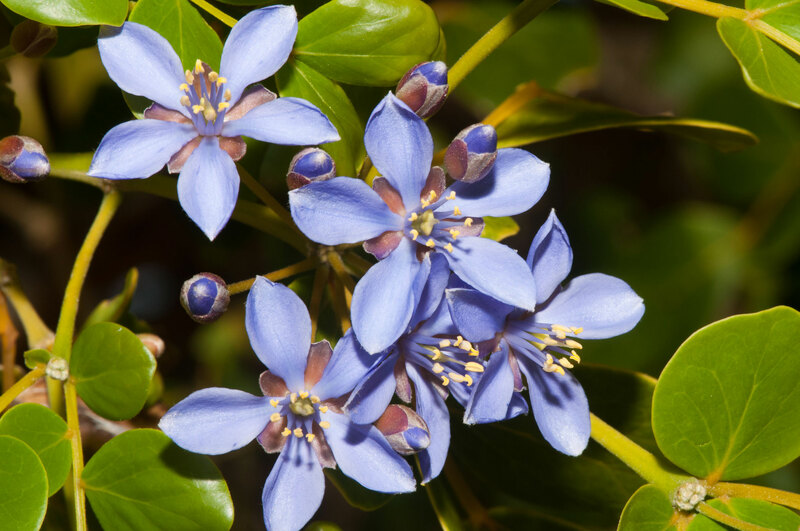 The gaïac tree is also known as the lignum vitae, guaiacum or palo santo. It is native to the Caribbean, it is endangered and it has the hardest wood in the world. It is thought of as a small tree, but that’s not really true and it was used as a cure for many diseases, although it probably didn’t work. At one time it was one of the most important trees in the world, and it has always been one of the most beautiful. Gaïac branches form intricate shapes. As a native species, the gaïac evolved to live in the Caribbean. It grows slowly, but can survive in dry and inhospitable environments. They can live near salty coasts, rooted in limestone with just the slightest hint of soil. Their wood is incredibly hard, making the tree sturdy against storms and high winds. The hardest wood in the world was also very valuable. Gaïac trees were cut down everywhere they could be found, and fashioned into a great many different objects. Mortars and pestles use to pound arrowroot were made from gaïac, as were billiard balls, police truncheons and clock gears. It was also favored for variety of ship parts, like deadeyes and shaft bearings. In time, metals, plastics and other materials replaced gaïac wood for most uses, but by then much damage had been done to this tree. The thousand-year-old trees reaching nearly 20 meters into the sky are almost entirely gone now. The hundred-year-old trees that have grown up since then lead us to believe that the gaïac is a small species. It remains incredibly beautiful, with a thick canopy that changes color with the seasons. Deep green leaves stand out during the dry season when the tree is surrounded by browns and yellows. Blue flowers explode into bloom once or twice a year, creating a flurry of activity by bees and butterflies. Tens of thousands of orange fruit can cover a mature tree, bursting open to reveal the seeds in their bright red coating. The blue flowers of the gaïac. Today the gaïac is resurgent on St. Martin, planted in yards and along roadsides by those familiar with its charms. In a century or two, perhaps it will reclaim its rightful place on the island and in the imagination of those living here. Learn more about the gaïac at Amuseum Naturalis. Visit the museum for free on Tuesdays and Thursdays from 4-8pm or get more info at amuseumnaturalis.com. Caribbean Curiosities is a brand new column in The Daily Herald’s Weekender section. 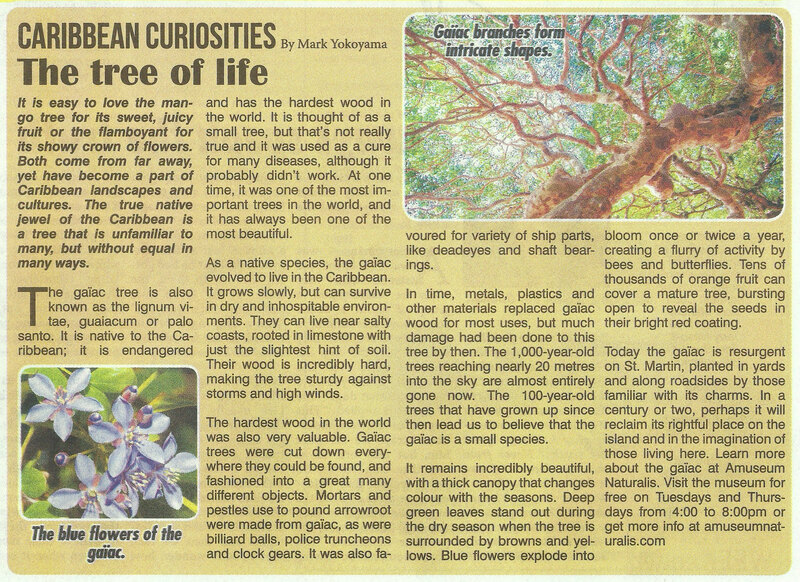 Each week, the column will take a closer look at something from the strange and wonderful world of St. Martin’s nature. Everything featured in Caribbean Curiosities can also be found at Amuseum Naturalis.